The modern electric screwdriver evolved out of the electric drill when manufacturers got rid of those slots in screws and adopted the cross pattern that a Pommie called Frearson devised in the 18th century. If you have a lot of screwing to do, get one. I find I use screws in places where I once used nails, like where it is hard to swing a hammer, etc. The fact that electric screwdrivers are cheap and available, has lead to a large range of cheap screws to. Or is it the other way round? Screwdriver gun - The famous, or should I sat infamous "Yankee" spiral ratchet screwdriver made by Stanley. Anybody out there remember a Yankee screwdriver? An early attempt to speed up driving screws. Pumping away with the head slipping out of the slots, split fingers and marred timber. We just didn't guess what was coming. Screwdriver gun - Makita cordless auto feed drywall fixing gun. Like their close relatives the electric drills there are many different types and sizes but they all have a few things in common. They all have a quick fit and change feature for changing the bits. Usually a lift up sleeve that lets the bit slip into a socket and then when the sleeve is released the bit is held firm by it's grooved shank. A forward and reverse switch. An adjustment to control the depth of embedment of the screw, or a pressure activated clutch. Some of them have a pressure sensitive trigger to adjust the speed. The manufacturers have been quick to design tools for specific trades and industries, like the variations on the drywall guns. 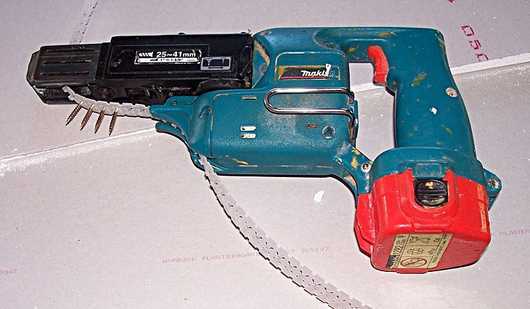 Most of the full time plasterboard fixers use heavy duty cordless ones like the one in the photo, and many with a larger battery pack in a shoulder bag, and the screws in a reel or strip type dispenser. 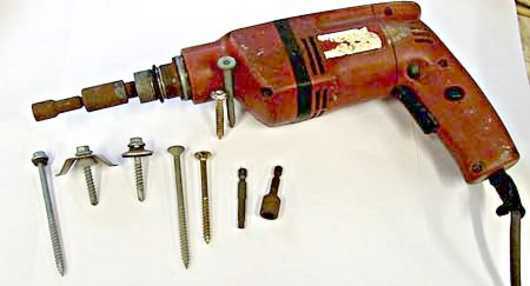 Screwdriver gun - An old Hilti screw gun, popular for roofing, with some of the screws. Note this one has the clutch adjuster cone missing, but still works OK.
Roofers use guns made for roofing, well balanced but powerful. The one above is my old Hilti. One of the most powerful screw guns that I've had was a two speed Wolf with a "D" handle. This was head and shoulders above the rest when it came to belting roof screws into hardwood battens. Screwdriver gun - Makita mains power drywall screwdriver. 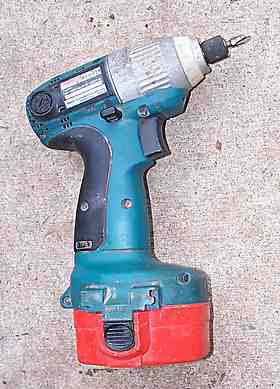 Power tools - Makita 14.4 V cordless impact driver. This would have to be an all time favourite. If it got stolen today I'd replace it tomorrow. 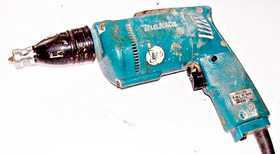 Here is a typical plasterboard (dry wall) gun. This one uses mains power. Used as the name suggests for fixing plasterboard, with sensitive controls for setting the screws just under the surface, but not bursting the paper. They can of course be used for other screwing jobs also. It has a clip for clipping onto you belt, as do most small drills and drivers. On the right is my Makita 14.4 volt small battery driven impact screwdriver. One of the few tools I can't and won't do without. If it got stolen I would buy another straight away. It is used for all types of screws. When the impact hammer cuts in it continues to drive the screws where conventional drivers would be skidding. It is maybe not as sensitive as the other non impact drivers, with their clutch settings etc, but after a while, like any tool, you get used to it. If you only buy one electric screwdriver, buy an impact one. Trust me. I have wandered over roofs whacking pan head teks through 1.2mm speed brace into 2.0mm steel purlins with this little beauty, then a few days later used it for wriggling 8g screws into cupboard door hinges. The cordless drivers (and drills for that matter), come in kits, with two batteries and a charger included in the kit.